‘Fortunately, no serious injuries or fatalities were found,’ says ER24 paramedics spokesperson Russel Meiring. 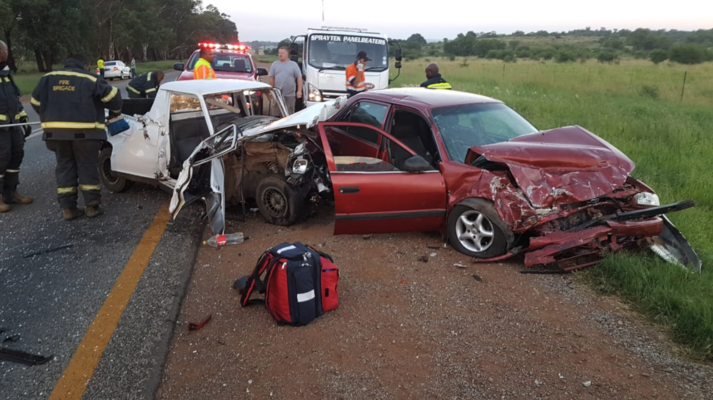 Three men were left injured on Monday morning after a collision between two light motor vehicles and a bakkie on the N12 near Potchefstroom in the North West. ER24 paramedics spokesperson Russel Meiring said their paramedics, along with other services, arrived on the scene at 5.50am to find the one light motor vehicle and bakkie on the one side of the road. The second light motor vehicle was found on the opposite side. “Paramedics assessed the patients and found that three men had sustained minor to moderate injuries. Fortunately, no serious injuries or fatalities were found,” said Meiring in a statement. He said the patients were treated for their injuries and were thereafter transported to hospital for further care. Local authorities were on the scene for further investigations.